Now I know I usually post about fashion, but this was too good a chance to miss. Yes, you see correctly. 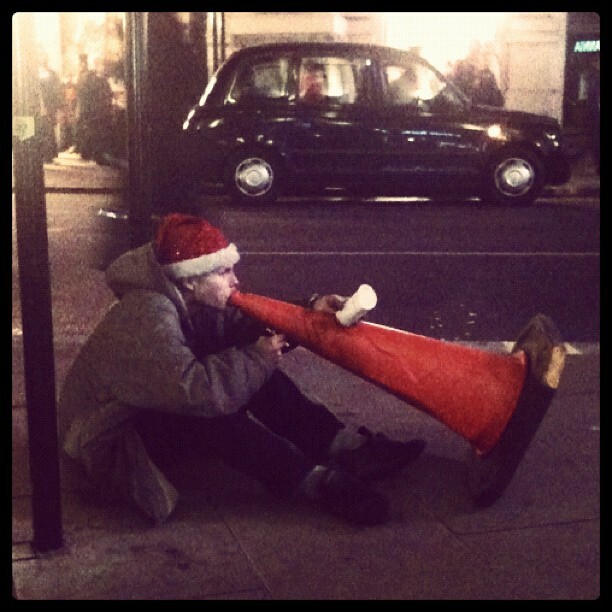 It is a tramp, playing Christmas tunes out of a traffic cone complete with a Christmas hat. I was literally gobsmacked. I must give credit to Fay for taking this photo, it's a great shot. And he even lit a cigarette then carried on with his playing. It was something I was definitely not expecting to see, and when we came back that way he'd left, the traffic cone returned upright for its regular use. It made me smile really, he looked pretty content, embracing the spirit of Christmas. And I think that's what we should all do!